Famous events and people from the past provide a rich source of scarecrow ideas. 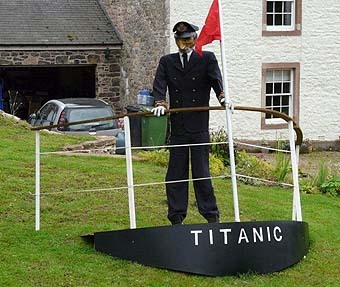 This scarecrow by Mr and Mrs Freer of Farlam Parish in UK shows chief engineer, Joseph Bell, of the massive passenger ship, RMSTitanic, at the moment when this famous ship sank in 1912! This fabulous scarecrow display really tells the story well, doesn't it! Joseph Bell was born and had lived in the town where this scarecrow was shown. Photograph courtesy of Hugh Beesely. Note: This page includes celebrity scarecrow ideas for you and your kids to make: scare crows about famous events and people in history.